Sweet Sentiment: Catching up with a fox! Catching up with a fox! Yeah, I was feeling behind on the marks finest papers challenges (aka:speedy fox and friends challenges) so I decided to combine two. 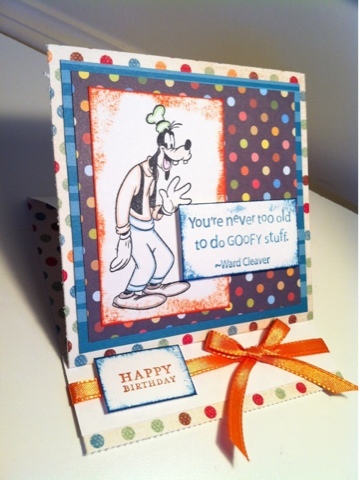 The sketch with a twist (use three patterned papers) and a masculine birthday card. I believe this satisfies both challenges! Woot woot! Now, what else should I do????? I LOVE Sundays! What a cute easle card! Great job! Thanks for playing along with us this week at Speedy Fox & Friends blog challenge! I love the papers and that Goofy stamp is too cute with the Ward Clever quote, which Is really fun! If you're looking for more to do on Sundays, that's Operation Write Home's sketch challenge day. We make blank inside cards for troops to send back home. 1,680,000+ since 2007, and it's a really supportive and inspirational group of card makers! What a fun card. Who doesn't love Goofy? Thanks for playing along with the SpeedyTV’s Sketch with a Twist challenge. We hope to see you again next week. Be sure to check out all the other challenges on SpeedyTV for more chances to win free stamp sets from Marks Finest Papers, a Heinrich Co. This is a super cute card! It's definitely going to make someone smile. I also love that you followed "the twist" and clearly used three different patterned papers, and in SUCH a cute way! Great job. Thanks for playing along with us at Speedy TV in our Sketch With a Twist Challenge. I really appreciate your participation, and hope you will continue to play along. A new sketch and challenge will be posted in the morning (7/17). I would love to see another one of your darling cards! Let's "follow" one another - I hope you will visit. this card is so goofy ! I love it ! Love you pal! P.S Thank you for playing with speedy fox and friends this week!